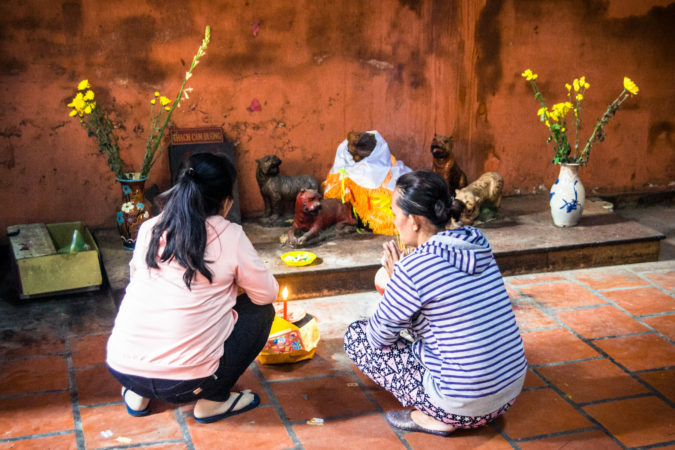 Outside the Thien Hau Temple in Cholon, the most famous of the region’s many historic halls. 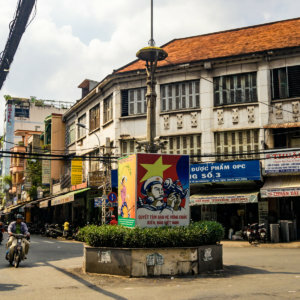 On three recent trips to Ho Chi Minh City I spent some time wandering around Cholon, a vast and historic Chinatown located about five kilometers west of the downtown core of colonial Saigon. 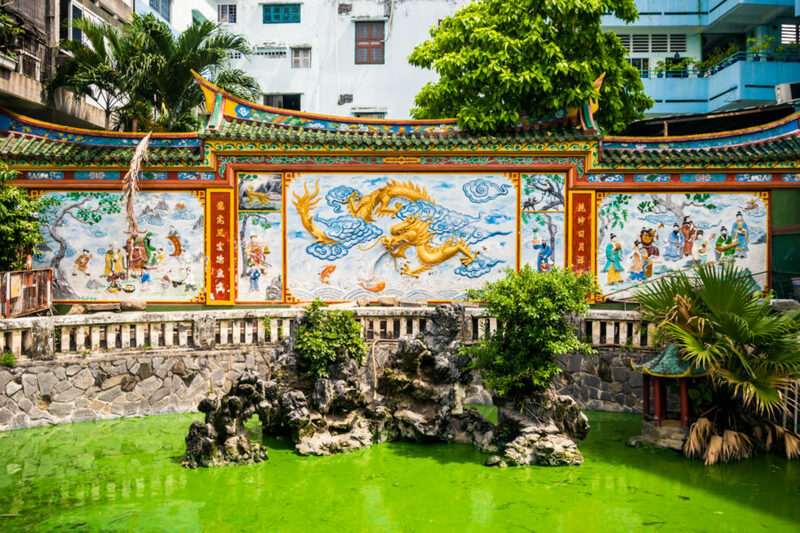 Originally settled in the late 17th century by ethnic Chinese settlers, the Hoa people 華人, it was known by its Cantonese name, Tai-Ngon 堤岸 (literally “Embankment”, but it is also roughly homophonous with “Saigon”). Later the Vietnamese dubbed it Cholon (“Big Market”) after the forerunner of the modern-day Binh Tay Market. The Hoa people were once the majority in Cholon but many fled persecution in the aftermath of Fall/Liberation of Saigon in 1975, and again during the Sino-Vietnamese War. Nowadays the Hoa people only account for approximately 5% of the population of Ho Chi Minh City (less than half the proportion of ethnic Chinese living in Toronto, my hometown) but their presence on the streets of Cholon remains discernible, particularly in the form of the many distinctive temples of the district. Tudigong in an elegant box with many tiger deities. 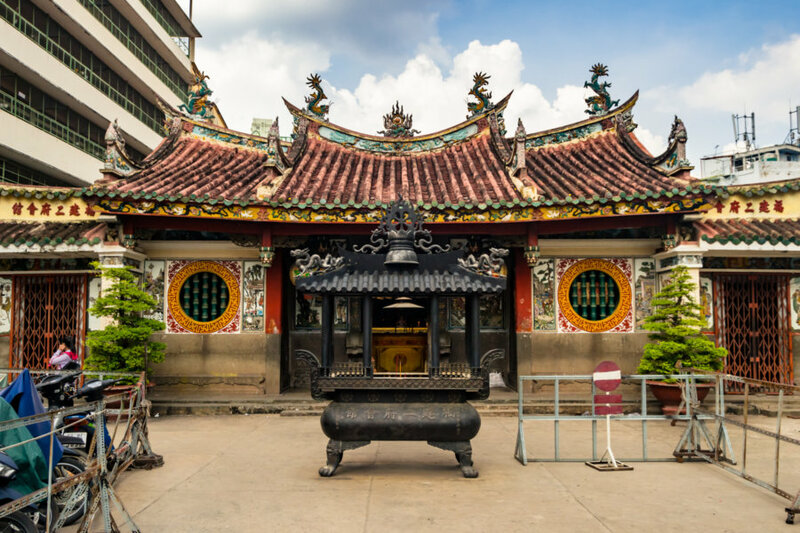 Founded in 1760 by Cantonese immigrants from Guangzhou, the Thien Hau Temple3 (Vietnamese: Chùa Bà Thiên Hậu; Chinese: 穗城會館天后廟4) is easily the most famous temple in Cholon, and you’ll regularly see tourists passing through. 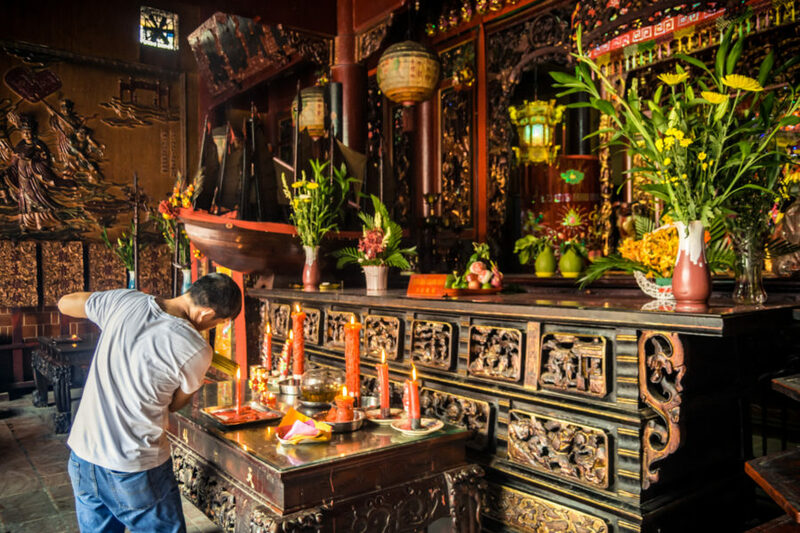 As with many of the other temples in the area this one venerates Mazu (also known as the Empress of Heaven (Mandarin Chinese: Tiān Hòu 天后), goddess of the sea and protector of seafarers and fisherfolk. 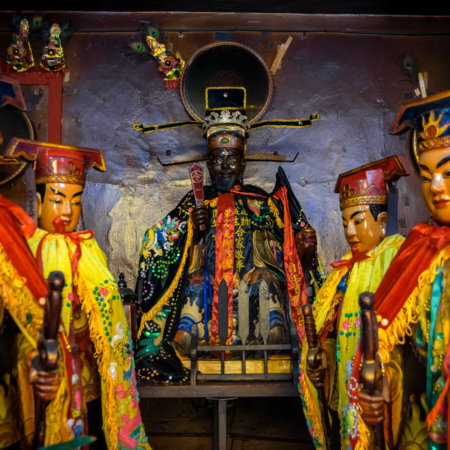 Mazu worship is common among pre-modern diasporic Chinese communities—migrants prayed for safe passage through treacherous waters and built temples in her honour after establishing themselves abroad. 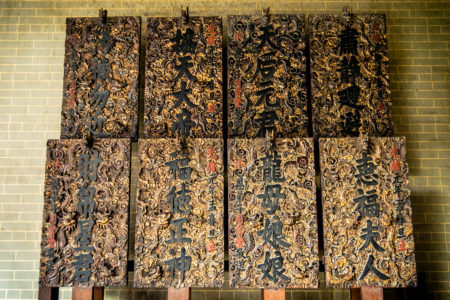 The characters over the entrance to the temple read Suìchéng Huìguǎn 穗城會館, its official name. 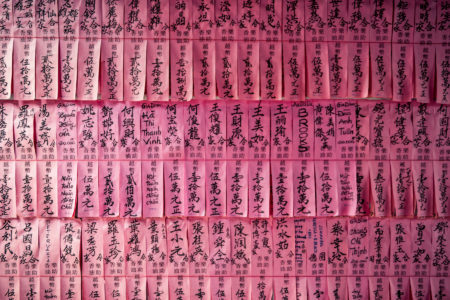 “Sui” is a traditional shorthand for Guangzhou. 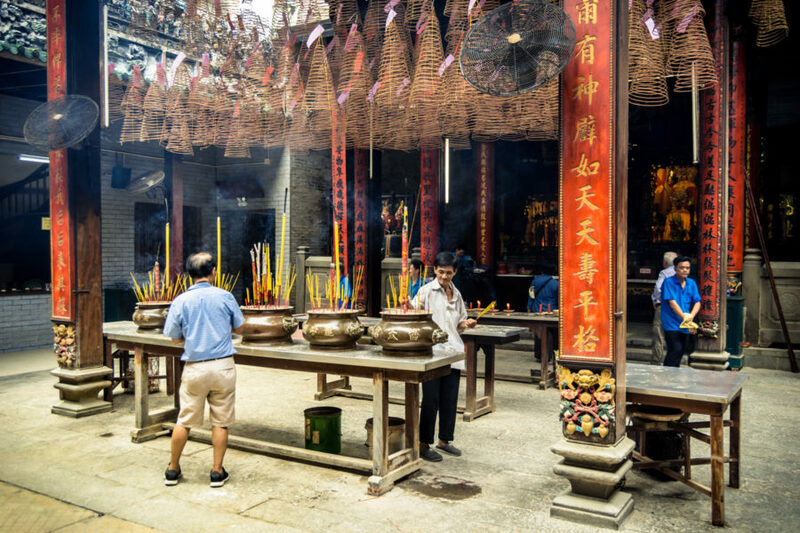 Incense coils dangle above the courtyard at Cholon’s most famous Mazu temple. 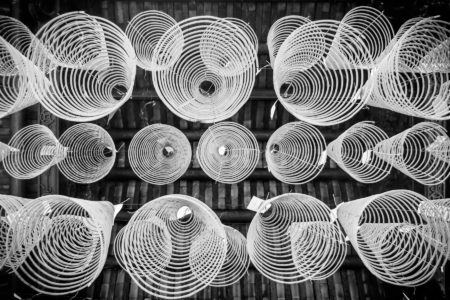 Hypnotic incense spirals at the Thien Hau Temple in Cholon. 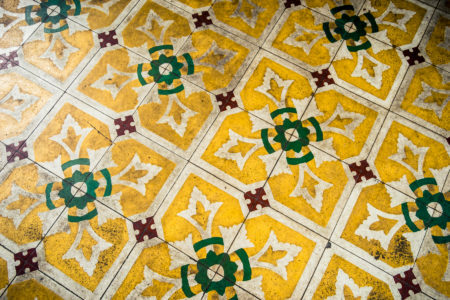 Vintage tile at the Thien Hau Temple in Cholon. 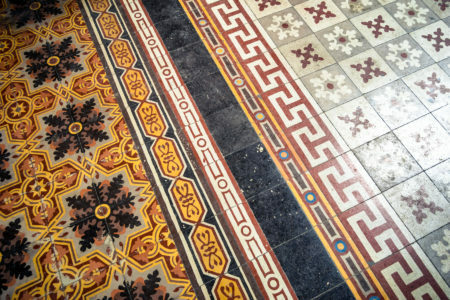 Gorgeous patterns across the temple floor. 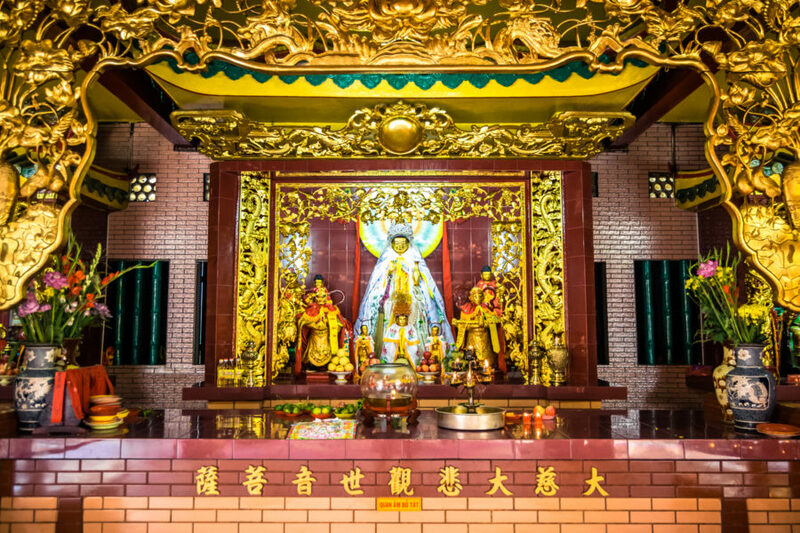 The main shrine at Thien Hau Temple in Cholon. Apparently the wooden carving of Mazu predates the founding of the temple! 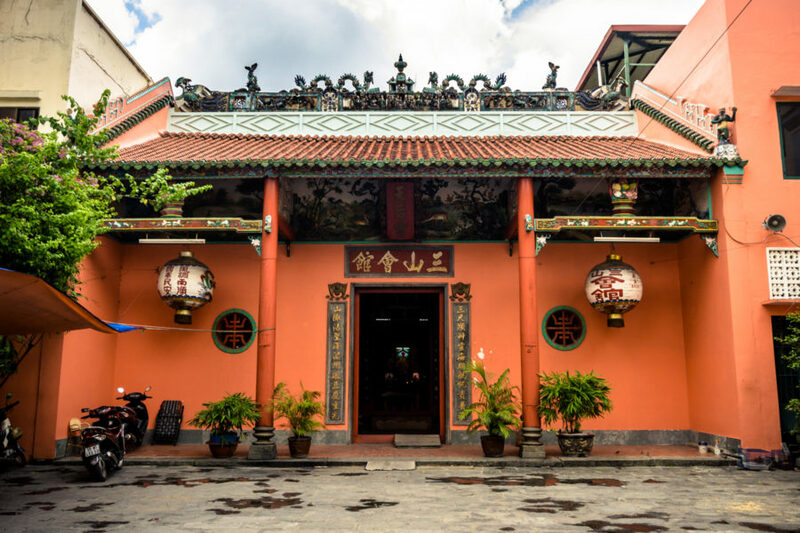 Across the street from the Thien Hau Temple is the Tam Son Guildhall (Vietnamese: Hội Quán Tam Sơn; Chinese: 三山會館), built by settlers from Fuzhou in Fujian province, very close to the birthplace of Mazu. Most sources suggest this temple was founded in 1839 but there appears to be some uncertainty about this date. 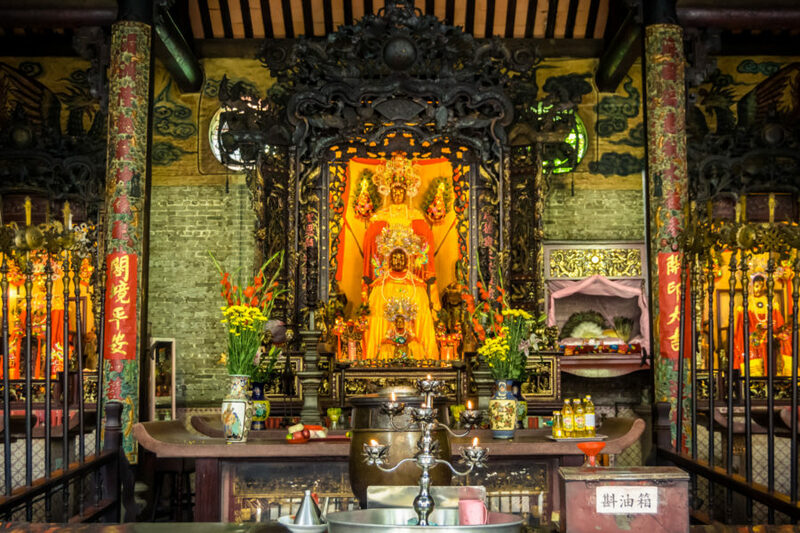 Mazu is worshipped here, as you might expect, but the main shrine venerates Mẹ Sanh (Chinese: 註生娘娘), a fertility goddess. 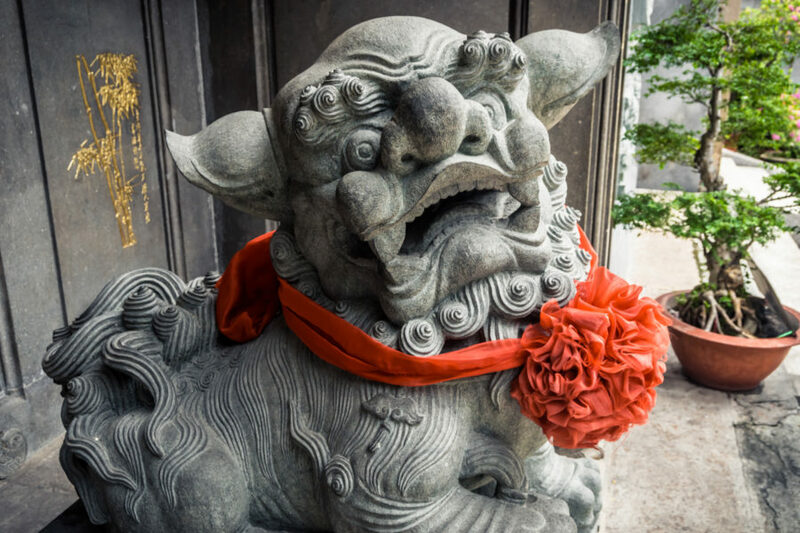 I was most intrigued by an unfamiliar representation of Tǔ Dì Gōng 土地公, the god of land, and a shrine to his constant companion, the tiger deity Hǔ Yé 虎爺. 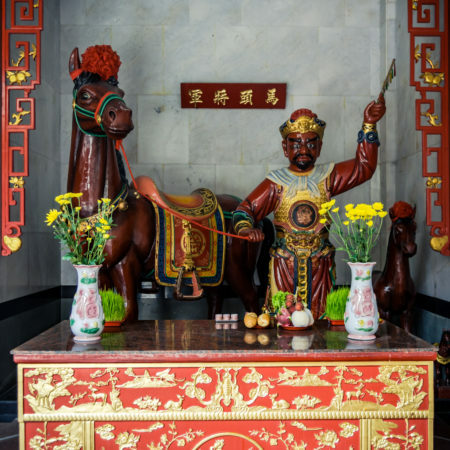 The small shrine on the opposite side of the temple features Chì Tù Mǎ 赤兔馬, the warhorse belonging to famous general Guān Yǔ 關羽 (also known as Guān Gōng 關公, who appears elsewhere in the same temple), and two idols representing Wú Cháng Guǐ 無常鬼 (literally “Ghost of Impermanence”), an underworld deity charged with administering divine justice5. 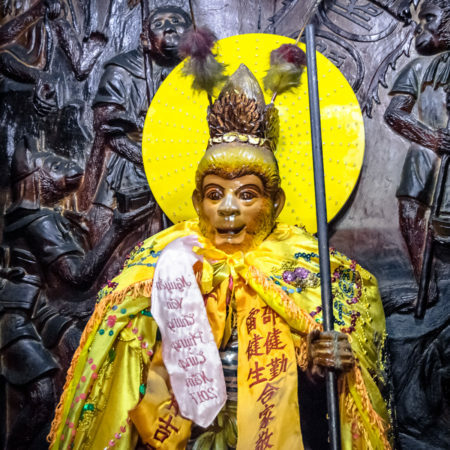 This being’s distinctive headpiece is emblazoned with the phrase Yī Jiàn Fā Cái 一見發財 (“Get Rich at First Sight” and “Become Rich Upon Encountering Me” are two translations I’ve seen around the web) and supplicants pray to this god for luck and prosperity. The modest Tam Son Hoi Quan Pagoda from the street. 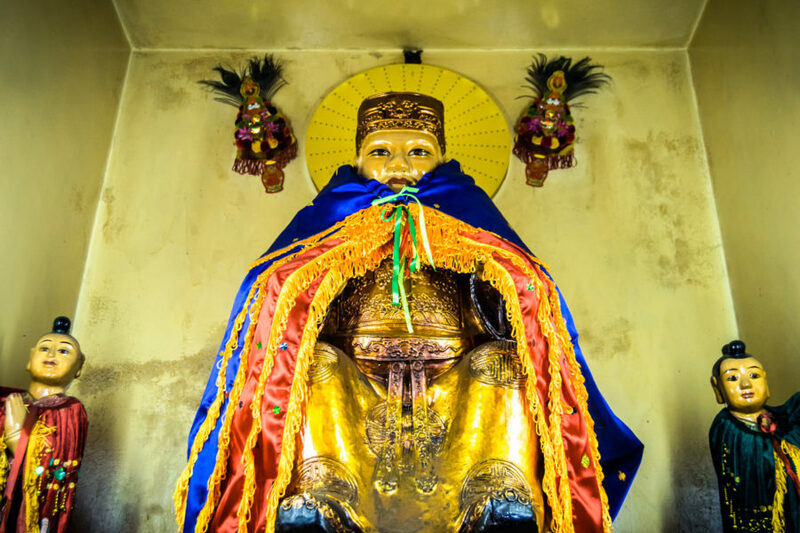 Tu Di Gong, the Land God, on the left side of Tam Son Temple. 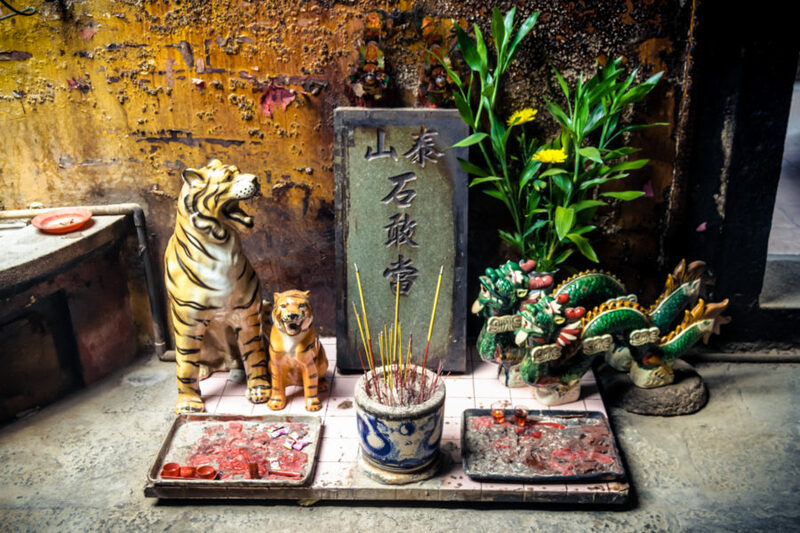 Tiger shrine inside Tam Son Temple. Praying to the tiger gods. The altar on the right side of the temple features an assortment of deities. 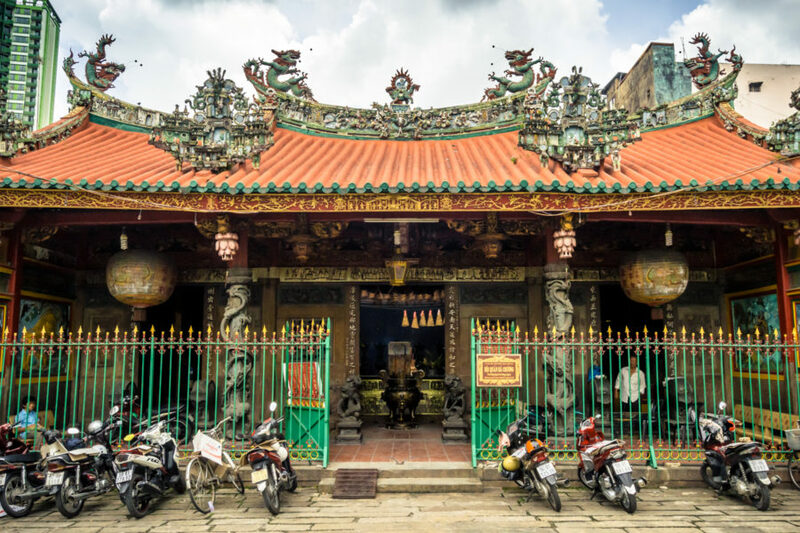 Quan Am Pagoda (Vietnamese: Chùa Quan Âm; Chinese: 堤岸觀音廟) is another famous temple in Cholon regularly frequented by tour groups. 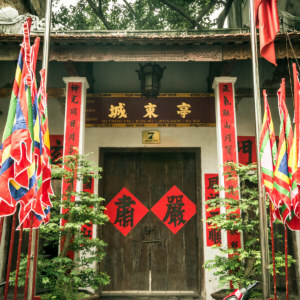 Officially known as 溫陵會館 (Vietnamese: Hội Quán Ôn Lăng), this guildhall traces its history back to 17406 and derives its name from a traditional term for Quanzhou, a historic port in Fujian. 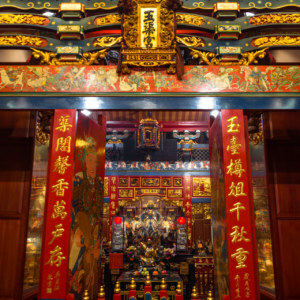 This particular temple has much more of a Buddhist focus than the others, and the primary object of worship in this temple is Guān Yīn, a Bodhisattva commonly known as the Goddess of Mercy in English7. An altar featuring three figures Sān Bǎo Fó 三寶佛) surrounded by the Eighteen Arhats 十八羅漢 also caught my eye as I wandered through. This holy trinity almost certainly includes Amitābha 阿弥陀佛 but the others are unknown to me. 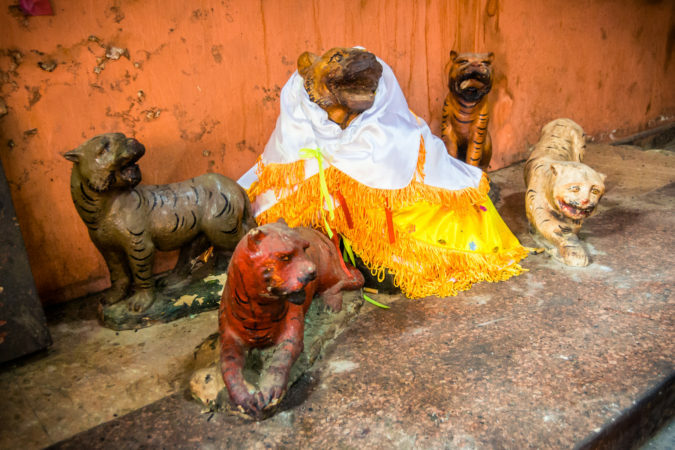 Finally, I was intrigued to find another small shrine to Hu Ye, the tiger god, and something I hadn’t seen before: a mythical chimera known as Pí Xiū 貔貅 (中文), which comes in male and female forms distinguished by the number of horns (one for male and two for female). The half-moon pond in front of the Quan Am Pagoda. 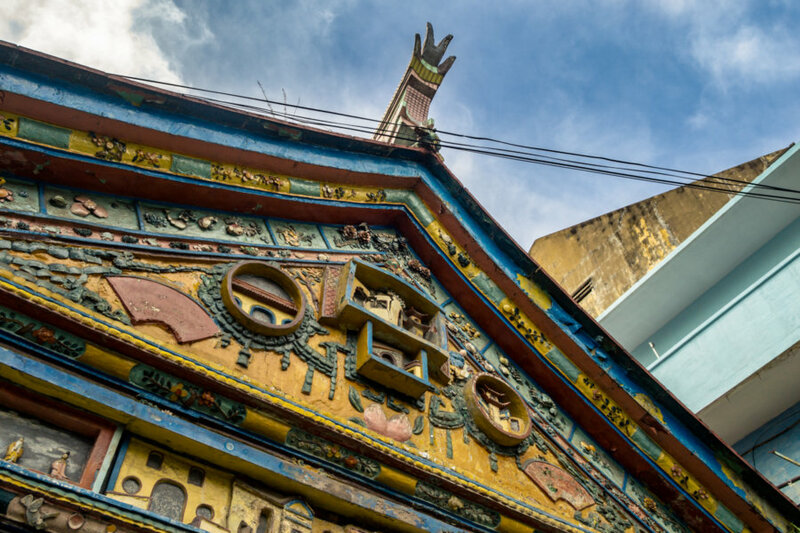 A closer look at the ceramic ornamentation on the outside of the Quan Am Pagoda in Cholon. 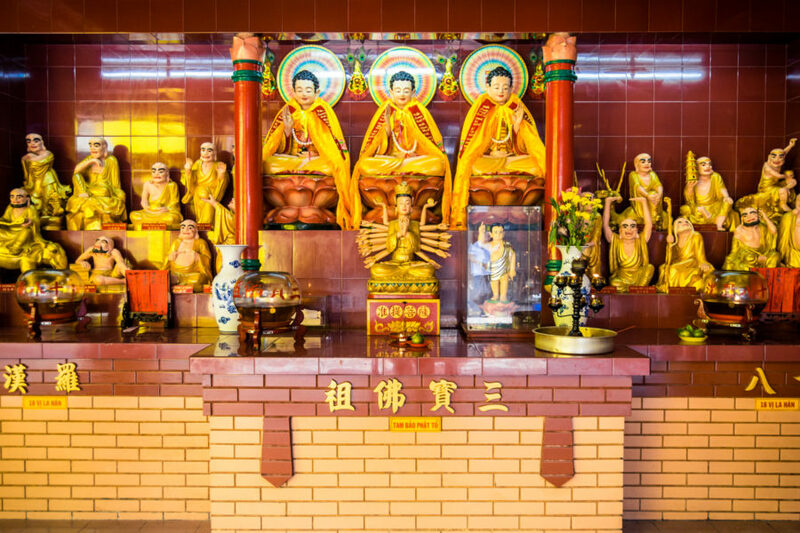 Shrine to the Three Jewels and the Eighteen Arhats on the left-hand side of the Quan Am Pagoda. 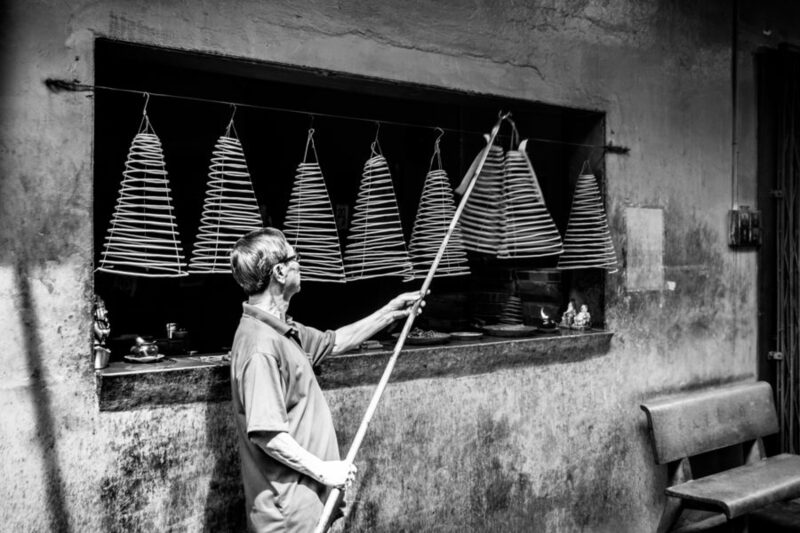 Raising an incense coil at the Quan Am Pagoda. 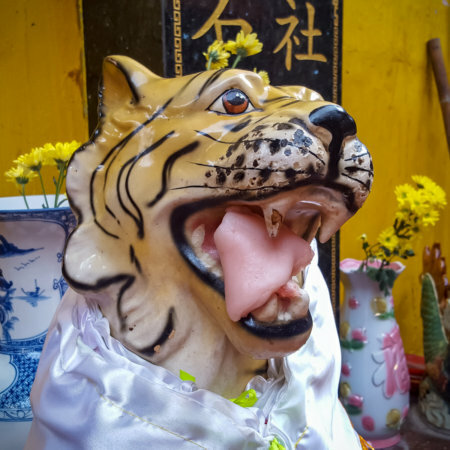 Another shrine to the tiger god—but this time Hu Ye is joined by Pi Xiu! Phuoc An Hoi Quan Pagoda (Vietnamese: Hội Quán Phước An; Chinese: 福安會館) is less of a mystery than the others; this guildhall was constructed in 1902 to serve the immigrant community from Fu’an in northeast Fujian. 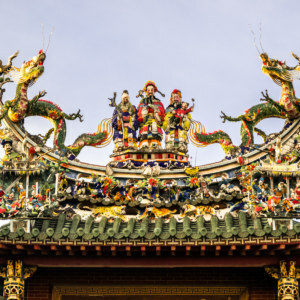 The primary deity worshipped here is the red-faced general Guan Yu (hence the Chinese name, Guān Dì Temple 關帝廟, “Emperor Guan”), but you’ll also find many others deities including Sūn Wù Kōng 孫悟空 (represented here as Tề Thiên Đại Thánh 齊天大聖), the Monkey King from the 16th century Chinese classic Journey to the West. I was most impressed with the beautiful ceramic murals inside this particular temple; this art form, jiǎn nián 剪黏 (“cut and paste”), is more often seen on temple exteriors. 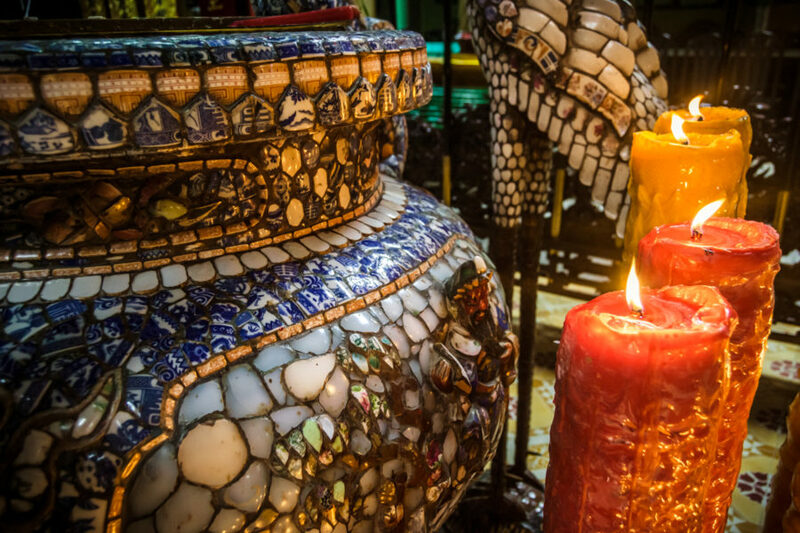 Even the traditional tripodal censer is covered with fragments of porcelain! The stone guardian lions out front also seemed quite unconventional. A colourful stone guardian lion by the entrance. Sun Wu Kong, the Monkey King! 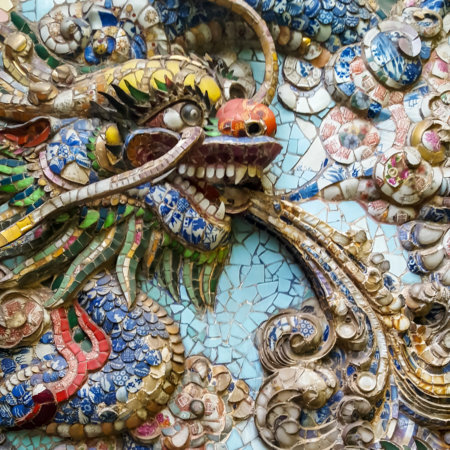 An eye-catching ceramic mural of a dragon. 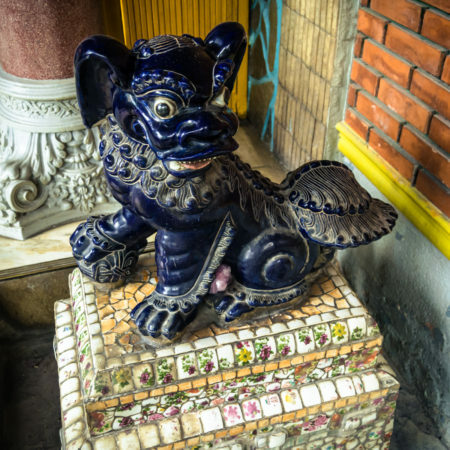 An unusual blue figure in front of Phuoc An Guildhall. 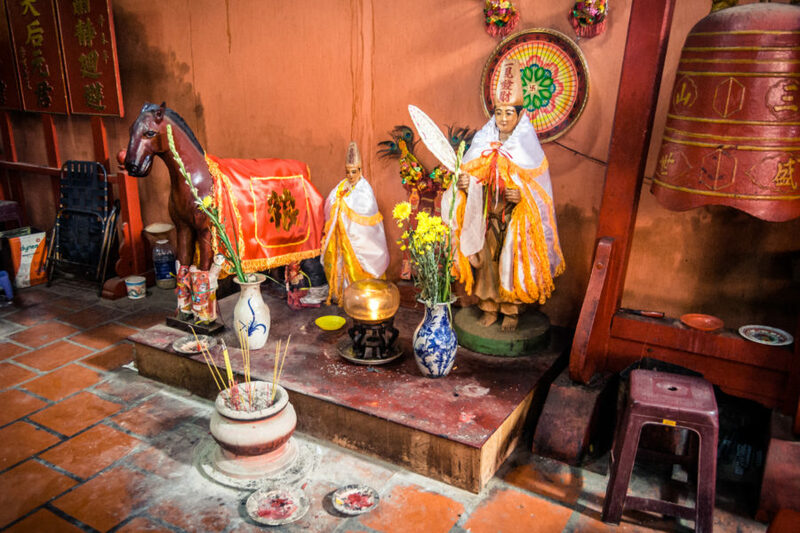 Horse and groom at Nghia An Hoi Quan Pagoda. 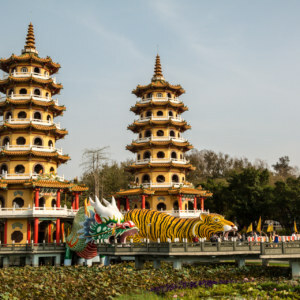 Nghia An Hoi Quan Pagoda (Vietnamese: Hội Quán Nghĩa An or Chùa Ông; Chinese: 義安會館) dates back to 1819 and was built by people from Chaozhou (also known as Teochew). 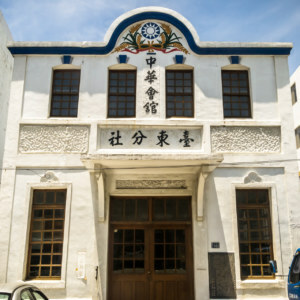 As with several of the other guildhalls profiled here this one derives its name from a very old term for Chaozhou, one that dates back to the 5th century in this case. 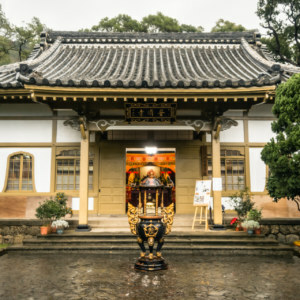 This particular temple is known for its woodcarvings, something I must have overlooked as I didn’t end up taking many photos here for whatever reason. 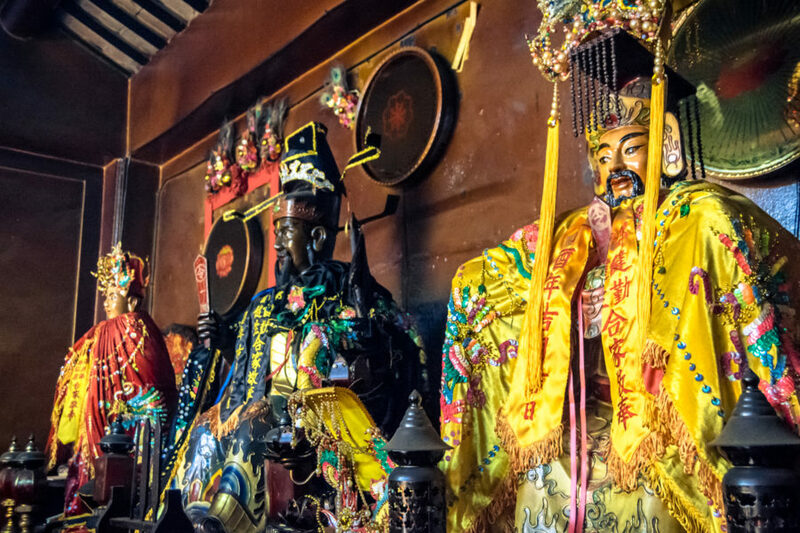 As with the previous temple this one is dedicated to Guan Yu, not only a god of war but also trade and commerce. 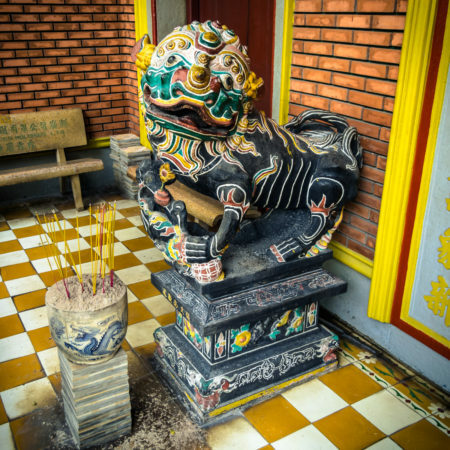 A traditional stone lion guards the entrance to Nghia An Hoi Quan Pagoda. The entrance to an ornate temple that looks almost new. 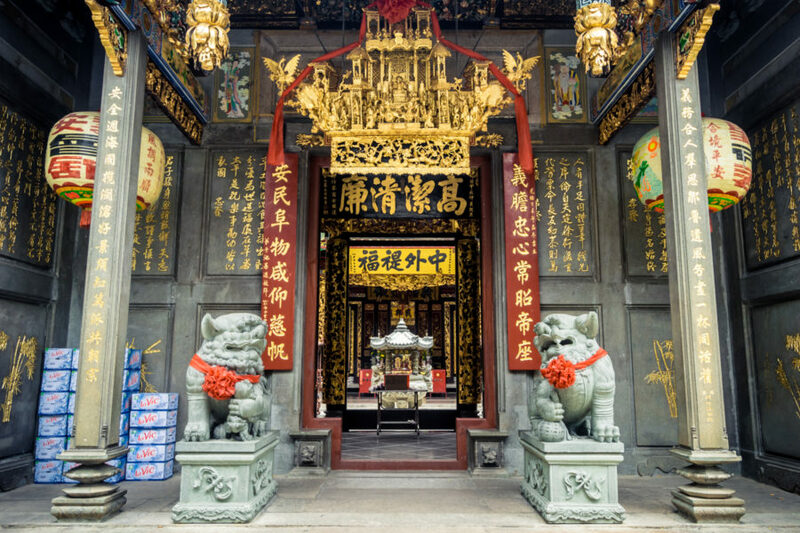 Founded in 1809, Ha Chuong Hoi Quan Pagoda (Vietnamese: Hội Quán Hà Chương; Chinese: 霞漳會館) is closest in appearance to the southern Fujian style of temples seen across much of Taiwan. 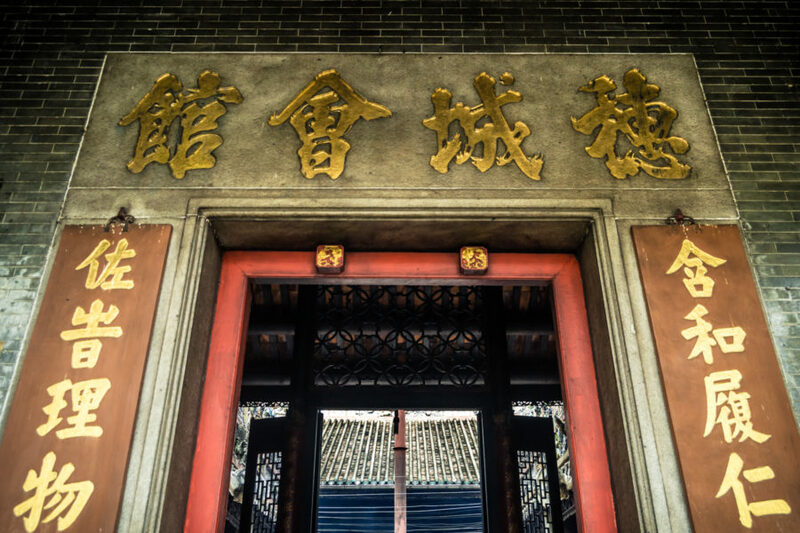 The formal name of this guildhall derives from an ancient term for Zhangzhou in southern Fujian. This is also primarily a Mazu temple but there’s quite an assortment of other shrines to be seen—as well as a deity I’ve noticed nowhere else, a dark-faced judge with a crescent moon on his forehead, Bāo Zhěng 包拯 (appearing here as Lord Bao 包公). 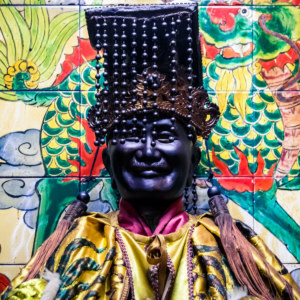 Chéng Huáng 城隍, the City God, also makes an appearance, as does Tài Suì 太歲, a personification of Chinese astrology. 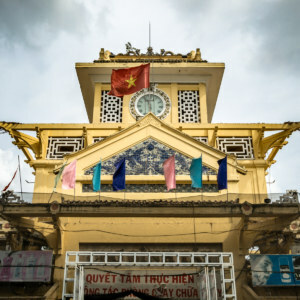 Exterior shot of Ha Chuong Hoi Quan Pagoda. Now this is a style I am familiar with from my time in Taiwan! 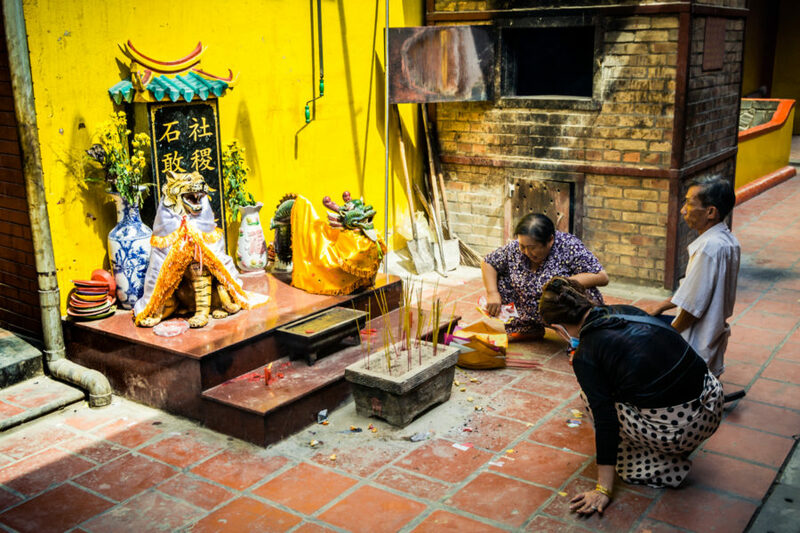 Lighting Incense at the Ha Chuong Hoi Quan Pagoda. Notice the boat on the altar? Hu Ye and Pi Xiu shrine at Ha Chuong Hoi Quan Pagoda. 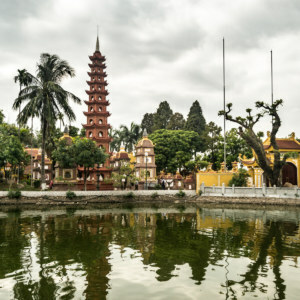 Finally we arrive at what is popularly known as the Ong Bon Pagoda (Chùa Ông Bổn), an outlier from the others for several reasons. 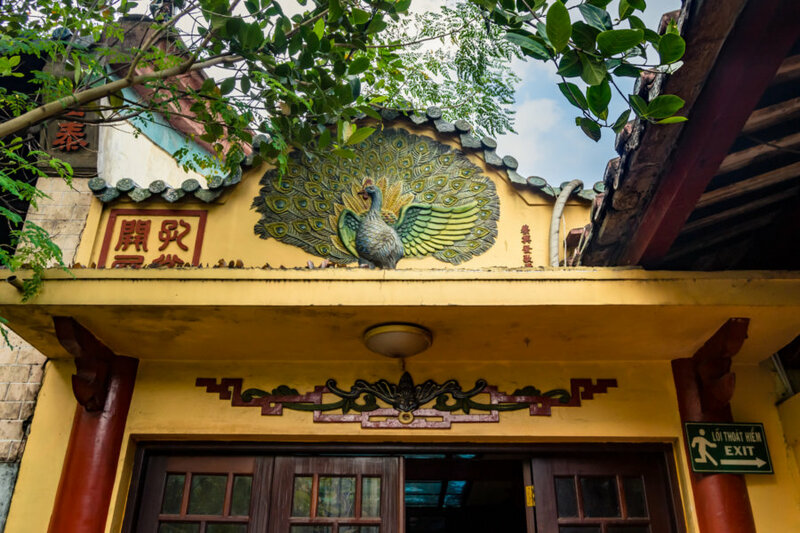 This is the oldest temple on the list, dating back to 1730, and also the only one built to serve two migrant communities—from Quanzhou and Zhangzhou. This should explain the formal name of the underlying guildhall, 二府會館 (Vietnamese: Miếu Nhị Phủ8), which translates to “Two Prefecture Guildhall”. Enshrined here is Tu Di Gong, the Land God, evidently known to Vietnamese as Ong Bon. 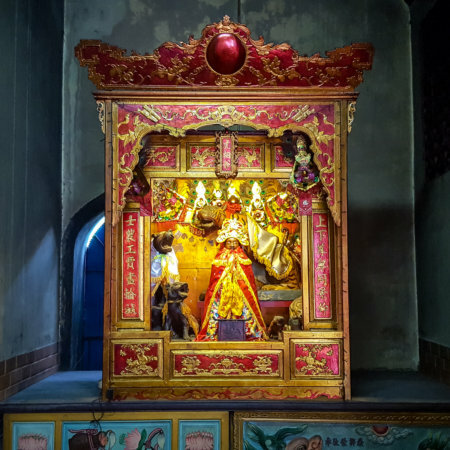 English language sources refer to Ong Bon as the god of “wealth and happiness” but in Taiwan we usually think of the Land God as a protective deity, warding off evil and ensuring the health and welfare of the local populace with the assistance of Hu Ye, his tigrine steed. Ong Bon Pagoda, the oldest of the lot. 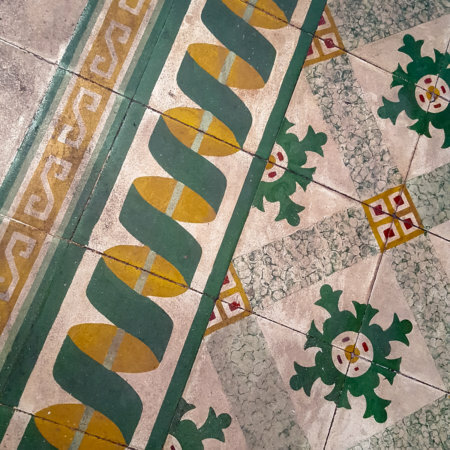 The characters on either side translate to Fujian Two Prefectures Guildhall. Peacocks and bats adorn the courtyard behind the main hall at the Ong Bon Pagoda. 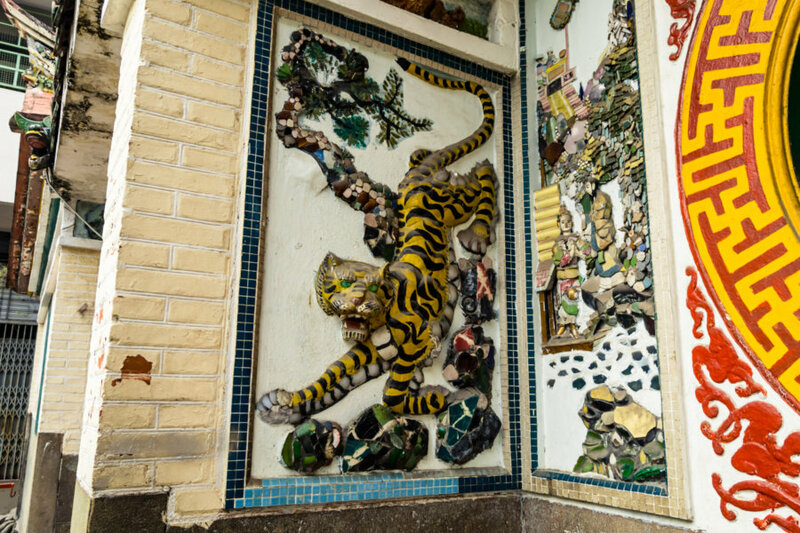 Exit the tiger at the Ong Bon Pagoda in Cholon. 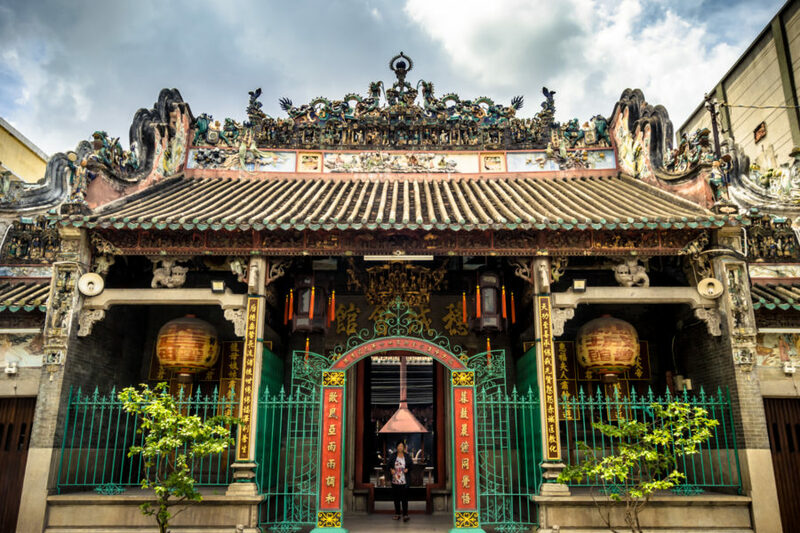 Hopefully this has been an informative introduction to Chinese temple culture in Cholon, Ho Chi Minh City’s historic Chinatown. This post is by no means comprehensive; I didn’t manage to visit every temple in Cholon, nor would I claim to be an expert in these matters. 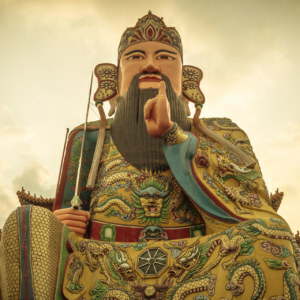 I’m still learning about Chinese folk religion so there’s a very good chance I’ve misattributed some deities or made other mistakes—please feel free to let me know in the comments or by sending an email.